HEVC (H.265) codec is supported by multiple NVidia GPUs so now it's also supported in our Live Transcoder. You can use Transcoder to decode and encode H.265 on your hardware under both Linux and Windows. You can take a look at the list of NVidia GPUs capable of hardware encoding acceleration. To make HW acceleration work, you need to install the graphic card drivers into the system. Use this link to download and install them. 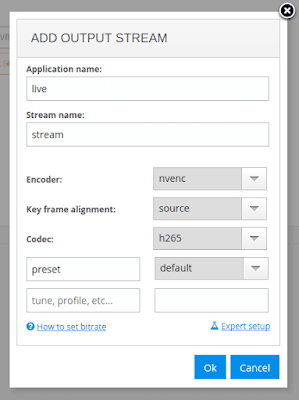 If you haven't yet installed Nimble Streamer transcoder, use this page to find proper setup instruction. Notice that NVENC has a couple of known issues, please check Troubleshooting section below in this article. The transcoding scenarios are created using our web UI. You can check this YouTube playlist to see how various use cases are defined. Takes just a couple of minutes to complete. To set up NVENC settings you need to open encoder settings dialog and choose "nvenc" as the Encoder and select h265 as Codec. After that you can add various parameters and set up specific values to tune up your encoding process. Please find full list of available encoding parameters below. Specifies the level of the encoded bitstream. Selects which NVENC capable GPU to use. First GPU is 0, second is 1, and so on. Number of pictures within the current GOP (Group of Pictures). Specifies maximum number of B frames between non-B-frames. Specifies the DPB size used for encoding. Setting it to 0 will let driver use the default dpb size. The low latency application which wants to invalidate reference frame as an error resilience tool is recommended to use a large DPB size so that the encoder can keep old reference frames which can be used if recent frames are invalidated. Set output FPS numerator and denominator. It only affects num_units_in_tick and time_scale fields in SPS. Source stream FPS or filter FPS is used if fps_n and fps_d is are set. Sets max bitrate in Kbps. Specifies the VBV(HRD) initial delay in Kbits. Specifies the VBV(HRD) buffer size in Kbits. Specifies the initial QP to be used for encoding, these values would be used for all frames if in CQP mode. Specifies the minimum QP used for rate control. Specifies the maximum QP used for rate control. Specifies the initial QP used for rate control. Specifies the desired motion vector prediction precision. AQ strength scale is from 1 (low) - 15 (aggressive). Set to enable to minimize GOP-to-GOP rate fluctuations. Enable lookahead with depth <lookaheadDepth>. Disable adaptive I-frame insertion at scene cuts (only has an effect when lookahead is enabled). Specifies the minimum size of luma coding unit. Specifies the maximum size of luma coding unit. Currently NVENC SDK only supports maxCUSize equal to 32. Use of long term reference pictures for inter prediction. Gradual decoder refresh or intra refresh. If the GOP structure uses B frames this will be ignored. Specifies the interval between successive intra refresh if enableIntrarefresh is set. Requires enableIntraRefresh to be set. Will be disabled if NV_ENC_CONFIG::gopLength is not set to NVENC_INFINITE_GOPLENGTH. Specifies the length of intra refresh in number of frames for periodic intra refresh. This value should be smaller than intraRefreshPeriod. Specifies the LTR operating mode. Set to 0 to disallow encoding using LTR frames until later specified. Set to 1 to allow encoding using LTR frames unless later invalidated. Specifies the number of LTR frames used. If ltrTrustMode=1, encoder will mark first numLTRFrames base layer reference frames within each IDR interval as LTR. If ltrMarkFrame=1, ltrNumFrames specifies maximum number of ltr frames in DPB. If ltrNumFrames value is more that DPB size(refs) encoder will take decision on its own. When sliceMode == 0 and sliceModeData == 0 whole picture will be coded with one slice. sliceMode = 3, sliceModeData specifies number of slices in the picture. Driver will divide picture into slices optimally. Specifies the max temporal layer used for hierarchical coding. These are the parameters which you can use already in order to control NVidia video encoding hardware acceleration. Linux version of NVENC has some known issues with HEVC support for outdated driver versions. then you need to update your driver to version 381.22 or higher. Version 378.13 has issues described in this discussion. Linux version of NVENC does not allow more than one HEVC decoding session for GTX 950. This is also a known issue which is reproduced for ffmpeg. This problem might not exist on other cards. Please check Transcoder troubleshooting article covering most frequent issues. We keep improving our transcoder feature set, so please contact us for any questions.